Happy Mother’s Day! I wanted to take a little time to acknowledged my amazing Mom and thank her for all that she has done for me. My appreciation of her support and love could not be overstated. Although she had initial concerns about my vegetarianism (“Where will you get the protein you need? !”), she has since begun to follow a vegan diet also. My sister Nadia can be thanked for giving her the encouragement she needed to start a healthy plant-based diet nearly a year ago. As a diabetic, my mother’s health was always a concern, but diet can be an enormous obstacle if all the pieces don’t fall in the right place. 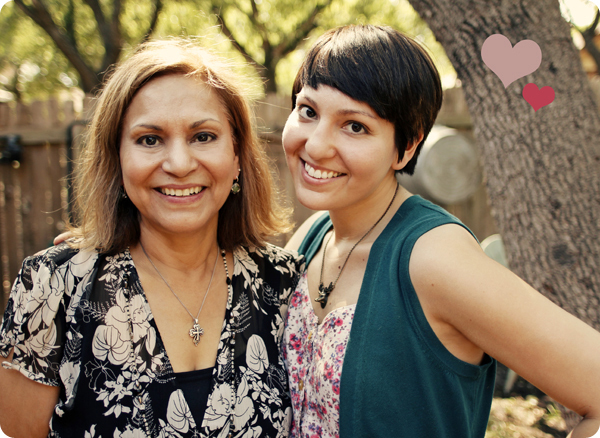 I spoke with my mother last night about her veganism (It’s still crazy to say that!) and how it’s positively affected her entire life. What has been the most positive aspect of following a vegan diet? How well it’s controlled my diabetes. Clinically, I don’t have diabetes [anymore]. About a week and a half ago I visited the Doctor. My numbers were in a ‘normal’ range. I wasn’t expecting it to be as low as it was, it’s the diet. Did you ever think you could enjoy a meat-free existence? Nope. I didn’t. I find that I read labels a lot and that I don’t miss any of the meats or things I used to eat. I don’t miss them at all. I find that I make a conscious effort that everything I eat is what I’m supposed to. Do you often find yourself helping or educating others? Yeah, to the point where I’ve gotten myself into trouble. For whatever reason I get over enthusiastic. My enthusiasm has offended people or they’ve misunderstood. People come to me, most of them are more interested in how I’ve lost weight. I tell them and they respond with ‘I could never give up meat’. My response to them is ‘I follow this diet to be healthy, not to just lose weight’. My goal was to control my disease and lower my cholesterol. Losing weight wasn’t my initial goal. What has motivated you to stay vegan? The fact that I have such support from my family. They cared about my well-being enough to do this. Do you know why so many diabetics fail in their attempt to follow a healthy diet? Lack of support. It’s a feeling of depriving yourself [around others]. At my age you think it would be hard to change, but it isn’t. I want to go to the doctor, I’m proud of myself. I feel like I could never go back to eating meat. I guess because I feel good. It’s my mother amazing? She totally inspires me to be vegan and stay vegan. Happy Mother’s Day! This entry was posted in Celebrations + Holidays, Family + Friends, Interviews. Bookmark the permalink. All the more adventure as she jet sets around the world with you! I don’t know who is luckier, us for having her as our mommy or her for having the three of us!